I am the Director of Spacecraft Missions here at Planet and, along with our CEO Will Marshall, I previously worked at NASA analyzing the risk of space debris and developing mitigation strategies. We are acutely aware of the threat that debris poses to future satellite operations. We care deeply about it and are determined to operate openly and responsibly in space to ensure sustainable and universal access to low-Earth orbit, which we view as a limited and shared resource. Planet has adopted NASA Procedural Requirements for Limiting Orbital Debris as best practices. We produce an FCC and NOAA approved Orbital Debris Assessment Report for every launch. These reports include analysis to show that 100% of Planet satellites: 1.) pose a negligible threat to other objects while in orbit, 2.) that we never discard any junk while in orbit, and 3.) that we will burn up harmlessly in the atmosphere within 25 years. Planet’s agile aerospace approach depends on frequently upgrading the satellite hardware in our constellations. We therefore strive to launch our satellites into low orbits (400-600 km), where they will decay. This “planned obsolescence” approach means that our satellites fly below most other satellites, and below the congested 700-1,000 km orbital region. As is usually the case for cubesats, we fly as a secondary payload, and have little say over our final orbit parameters. Sometimes we need to accept orbits that are higher than our desired orbit, as is the case with Flock 1c, which was launched into a 620 km sun synchronous orbit. We always ensure that our satellites are well below the UN 25 year guideline, and we will never launch a satellite into an orbit with a predicted lifetime greater than 25 years. 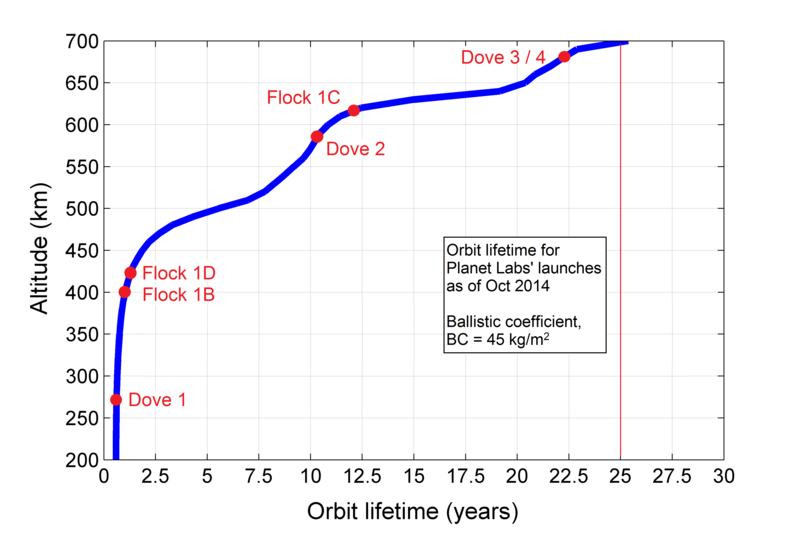 Our analysis of these satellites, which includes their measured ballistic properties, shows that the orbit lifetime of flock 1c should be approximately 17 years. Planet has the orbital dynamics tools and skills to perform accurate conjunction assessments to determine the risk of our satellites colliding with anything else. We use these to plan launches and to address concerns from other operators on a case-by-case basis. For example, in February of this year we worked closely with NASA’s ISS and GPM orbit teams to show that Flock 1 would not affect the operations of either of these spacecraft. The long term effect of hundreds of cubesats on the Kessler Syndrome is an interesting question that needs to be addressed. The effect is dominated by a couple of things: 1.) objects above 700km, where lifetimes rapidly lengthen, and 2.) objects with large mass and cross sectional area, since these are more likely to collide and will produce larger debris clouds. To get a sense of the effect of Flock 1c on overall collision risk we ran an STK simulation to compare all eleven Flock 1c satellites versus a single larger object in the same orbit. 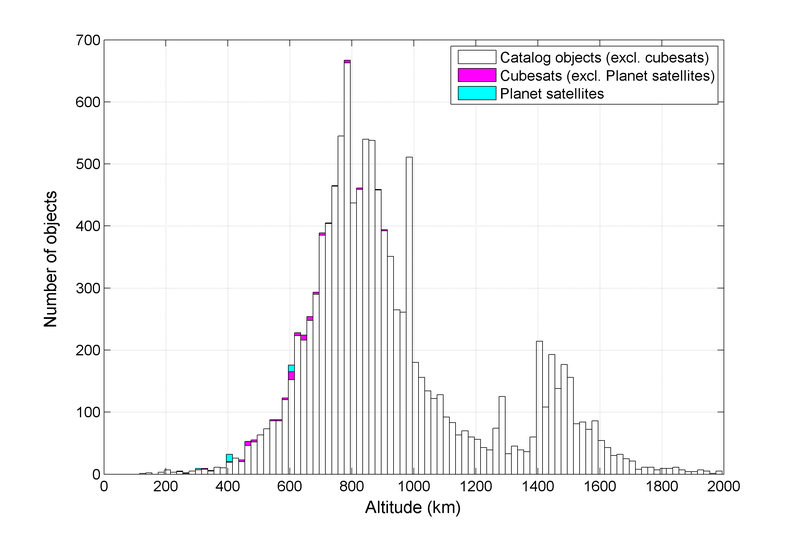 We found that our 11 satellites have about the same risk of collision with the rest of the catalog as a single object of 3.5m radius. In the unlikely event of collision, one of the tiny Flock 1C satellites would generate a much smaller volume of debris than the hypothetical 3.5m object. We are working with government and industry partners to continue to model this risk, and hope to publish results on this in the future. Additionally, we are already using differential drag for orbit maintenance, and are investigating how to implement it for collision avoidance. The greatest limitation with current collision predictions is the poor quality of TLE-derived orbits, which results in many false positives. For example, the infamous 2009 Iridium-Cosmos collision was not even in the top 10 conjunctions predicted for that day. To help increase the accuracy of collision predictions Planet maintains an orbit catalog of its own, which is produced using ranging data from several ground stations and is published daily to ephemerides.planet-labs.com. We are becoming a contributing member in the Space Data Center, which provides other operators with access to our orbits. In the event of a predicted close approach, we will directly share this data with the other operators to help them better understand the risk and decide on a course of action. Planet also reports all launches and orbits to JSpOC, and shares tracking data to assist them in identifying our satellites upon deployment. Additionally, early radio acquisition and orbit determination has long been a challenge for cubesat operators, who have traditionally relied on the JSpOC TLEs. We now consider this largely a solved problem thanks to our UHF radio’s ranging feature and our in-house orbit determination process. We are passionate about setting, and communicating, a good example for other players to follow, especially new cubesat operators. Since we intend to launch hundreds of satellites to fulfill our dream of imaging the entire Earth, every day, we have spent considerable effort to implement policies and develop tools that minimize our impact on the space environment. We have actively engaged with other cubesat operators to share our lessons learned, and we will continue to work with other satellite operators and regulators to set a precedent of safe cubesat constellation operations.